Toad dons his Flying Squirrel suit! Most-excellent plush from the Super Mario Bros. games. Fly, Toad, fly! Straight out of the New Super Mario Bros. U. game comes the Super Mario Bros. Yellow Flying Squirrel Toad 8-Inch Plush. Toad picks up the Flying Squirrel suit so that he can fly and cling to walls, blocks, and pipes. 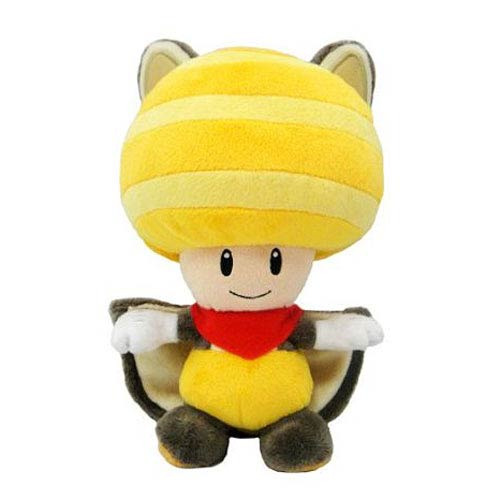 Now you can own Toad in a yellow outfit and wearing his Flying Squirrel suit in excellent 8-inch plush form! Ages 7 and up.